Yerevan is a fascinating capital city. It’s full of ancient history, delicious food and is an eclectic mix of modern culture and old traditions. But the best part about visiting this city is that most of Armenia’s famous sites are just a day trip away. It’s the perfect place to base yourself to explore – especially if you are on a budget. Here are the best day trips from Yerevan! Surrounded by the snow-capped mountains in the distance, Lake Sevan stretches out for as far as the eye can see. It’s the largest body of water in Armenia and is home to one of the most scenic monasteries in the country. 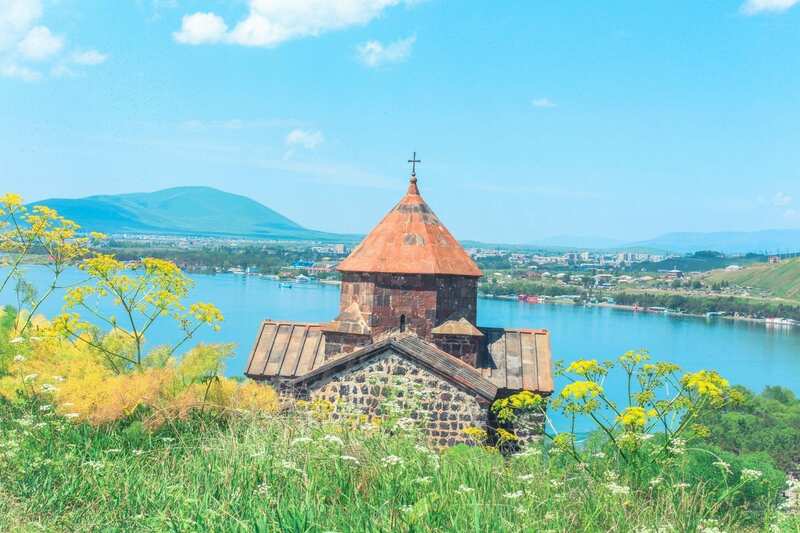 It’s the perfect day trip from Yerevan for nature lovers and beach bums. On the tip of the peninsula stands Sevanavank Monastery. Founded in 874 AD by Princess Mariam, the church isn’t the biggest or most impressive you’ll ever see, but the breathtaking landscape that will more than makes up for it. Don’t miss exploring the various trails leading from the church, the lake’s many beaches or the market. Instead of joining an expensive day tour, you can save a lot of money by using the local Marshrutkas to get around Armenia. Head to the Northern Bus Station. Buses leave every day from 9:00 to 18:00. Journey time is one hour. Make sure you tell the driver you want to go to Lake Sevan. He will charge you a little bit extra to drop you off, but it will save you the hassle of having to get another bus or a taxi once in Sevan. 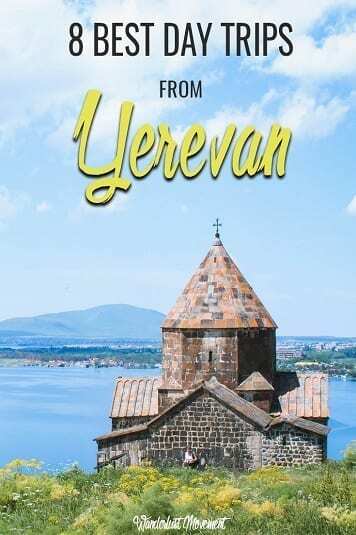 Coming back to Yerevan, you will need to catch a taxi from the lake to the Sevan bus stop. The taxi drivers here will try to drive up the price, so prepare to barter hard. Or if you don’t mind the exercise, you could always walk back to town. If you’re looking for the best view of Mount Ararat, make one of your day trips from Yerevan to Khor Virap. It’s one of the most important historical sites in Armenia and it’s where Gregory the Illuminator was held in a pit here for 14 years before he cured King Trdat III of a disease. The King then converted to Christianity, and soon after, Armenia became the world’s first Christian nation. Today, it’s the most visited pilgrimage site in the country. But even if you aren’t religious or into ancient architecture, the views alone are worth the visit. Go to Sansuntsi Davit Bus Station. If you’re staying close to the city centre, it’s easily accessible via the metro. Marshrutkas leave the station at 9:00; 11:00 and 14:00 every day. Tickets cost AMD 400 (R 11.00) one-way. Be sure to tell the driver you are going to the monastery. He will drop you off on the side of the road, and you’ll need to walk a short distance to get to the entrance. On the way back, if there are no marshrutkas you can hitchhike or take a taxi to the nearby highway to get a bus to Yerevan from there. Garni is home to a 76 AD temple built by King Trdat I. It’s set on the edge of a gorge overlooking the Azat River, and it attracts hundreds of visitors each year. For history buffs, it’s one of the best day trips from Yerevan. There are ruins of a Roman-era bathhouse, a 7th-century church and Urartian cuneiform inscriptions dating back to the 8th century BC. Entrance to the site costs AMD 1,000 (R28.00), or you can pay extra and get a guided tour for AMD 2,500 (R70.00). Catch a marshrutka at the Masiv Market bus station. The buses run every day from 10:00 to 20:30 but only depart when full. A single trip costs AMD 300 (R 9.00. Once you’re in town, hail a cab or walk to the temple. Journey time is around 50 minutes. Geghard Monastery is a World Heritage Site carved out of the rock face at the Azat River Gorge. Built in the 13th century, it’s the most accessible monastery from Yerevan and makes for a fascinating day trip. While its architecture is impressive alone, the monastery’s relics have made it famous. Geghard used to be the home of the spear that wounded Christ on the Cross. While this important artefact is now missing, the lore of it makes it one of Armenia’s most popular sites. Don’t forget to keep a lookout for the monastic cells built by the monks inside caves. And if you’re superstitious, tie a strip of cloth to a nearby tree to make a wish a come true. Go to the Masiv Market bus station and catch the marshrutka heading to Goght. Bus leave from 10:00 to 20:30 every day. A single trip costs AMD 300 (R 9.00). It’s possible to see Garni and Geghard’s monasteries on the same day as they are both only a couple of kilometres from Goght. Dilijan is the Armenian Switzerland. It’s surrounded by dense forests, beautiful mountains and a national park famous for its medicinal mineral water springs. Inside the park, you’ll find important Armenian cultural sites like the Haghartsin Monastery, Goshavank Monastery, Jukhtak Vank and the Akhnabat church. Dilijan National Park is a bird watcher’s paradise and one of the best day trips from Yerevan for travellers who want to go for a hike. Plus it’s home to some of Armenia’s largest animals like the Caucasian Brown Bear and the endangered Caucasian Lynx. It’s one of the top day trips from Yerevan for anyone looking for an excuse to escape the city for a few hours. Take a marshrutka from the Northern Bus Station. Buses run every day from 9:00 to 18:00. You’ll want to leave on the first bus, so you have enough time to explore as marshrutka’s heading back to Yerevan stop at 16:00. Set amongst towering red cliffs in a remote spot off the Yerevan-Goris highway, lies one of its most beautiful monasteries. Founded in 1205, it served as a residence for bishops and princes and even survived a raid by the Mongols. The best time to visit the monastery is early in the morning before the busloads of tourists arrive. Not only will you be able to capture the remoteness of the place, but you’ll have a chance to soak up its serenity. For those wanting to learn more about Noravank’s history, there is also a small museum that houses medieval artefacts and artworks. Catch a marshrutka from the Arshakunyats Bus Station heading to Yeghednadzor. Buses run from 8:00 to 19:00 every day. Tickets cost AMD 1,000 (R 28.00) one way. Journey time is just under 2 hours. Tell the driver where you are going, and you’ll be dropped off outside Edem Restaurant. From here, you can either catch a taxi, hitchhike or walk the 6 km to the monastery. If you want to get off the beaten track, plan a day trip to Tatev Monastery. It lies in the far south of Armenia, close to its border with Iran. The monastery is on top of a cliff overlooking the Vorotan gorge below. It was built in the 9th century and is known for its beautiful, yet eerie ambience. To reach Tatev Monastery, you’ll need to take a trip with the Wings of Tatev. It’s the longest cableway in the world, giving travellers incredible panoramic views of the landscape below. Tickets cost AMD 5,000 (R 138.00), but the good news is that there is more to see than just the monastery making the price more than worth it. The only downside about visiting this part of Armenia is that the journey here can take anywhere from 4 to 6 hours. If you want to include Tatev Monastery as one of your day trips from Yerevan, you’ll need to hire a car. Otherwise, you can take a marshrutka to Goris. There is only one per day, it costs AMD 3000 (R82.00) one way and takes 6 hours. Once in Goris, you’ll then need to hire a taxi to the cable car in Halidzor village. Byurakan is the Armenian mecca for space nerds. Set against the backdrop of Mount Aragats, it’s the country’s premier astronomical centre established during the Soviet Era and is an interesting day trip from Yerevan. During its heydey, it was home to the largest telescope in the USSR and played a crucial part in bringing Armenia into the realm of modern science. The observatory hosts guided tours for a small fee in several languages, or you can join an organised tour from Yerevan. Go to the Kilikia Bus Station to take a bus. The buses run from 9:00 to 19:30 every day. A single ride costs AMD 200 (R6.00). What are your favourite day trips from Yerevan? Hey! Awesome post! Very helpful. Thank you! I appreciate the post and have found a few of the bus stations mentioned, but I haven’t been able to find a “Masiv Market bus station”. Does it have a different name, perhaps? Just some additional info for you- It is called Gai Bus Station according to Google Maps (on Gai Ave., near the Gai statue). 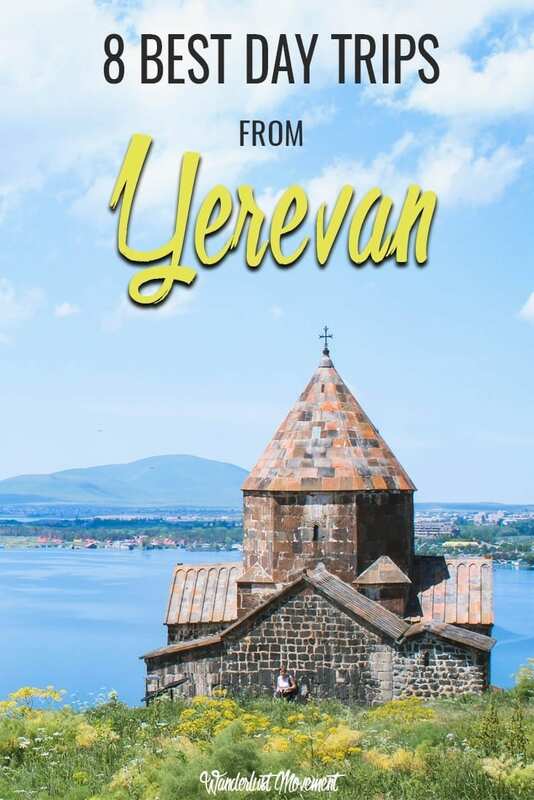 Amazing post, I am planning a 4 day trip to Yerevan, and your post will surely help me a lot, is it easy to communicate in English there? A lot more people speak English in Yerevan. You might struggle once you go out of the touristy areas. Thanks for your help Lauren. We caught local bus 467 at 0900 from David of Sassun station.It dropped us at Khor Virap turnoff so a short walt to the monastry. On the way back we hitched back to the highway,crossed the road and walked towards Yerevan. Just past the T road we waited by fruit stalls and caught bus 460 that took us back to the metro start point. Looks like 460 runs hourly at this time of year anyway.